I receive a lot of emails asking how to change the account to which benefits are paid from the Department of Veterans Affairs (VA). This includes disability, education, and survivor benefits. There are three ways to change your account: online, via telephone, or via the mail. 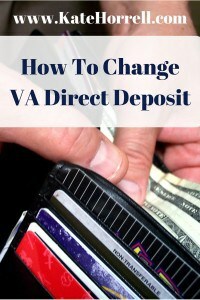 Changing direct deposit for VA benefits will make sure that your payment arrives to the right account on time. The VA says that the fastest and easiest way to change your account information is via their eBenefits system. Of course, this isn’t fast or easy if you don’t have an existing account. First, you’ll have to create a DS Login. Depending on your status, you might be able to complete this process online OR you might have to receive a verification code via the regular mail. While setting up a DS Login can take a little time and effort, I still encourage you to set up an account. Once you have online access, you can do everything electronically and have instant confirmation of your actions. In addition to changing bank accounts, the eBenefits system can be used to file disability claims, schedule VA health appointments, and access educational benefits. If you do not have a DS Login to use the eBenefits system, or if you are having trouble, then you can change your direct deposit account information via the telephone or regular mail. The telephone number to call is 1-877-838-2778. I have heard reports of long waits and recordings telling people to call back later. While using the telephone can require a long wait, you can get the name of the representative, which will hopefully help to ensure that your change is made properly. The last way to change your direct deposit information is via the mail. The benefit is that it doesn’t require waiting on hold or setting up a DS Login account. However, you have no confirmation that a mail change has been processed. Download and print the VA Form 24-0296, Direct Deposit Enrollment. Despite its name, you use the same form to change accounts. Mail your form to the address listed. Keep your old bank account open until your deposits start arriving into your new account. I called the number you provided, “they answered immediately, and completed automatic deposit in under 5 minutes. I must have caught them at the right time. It’s your lucky day! So glad the process went smoothly for you! I wish the Social Security Department’s website was as easy to follow as the VA’s. I have searched and searched for the form for direct deposit to the Social Security Adm. and found a form, but not sure if it is the right one. It is frustrating to try to work my way through these websites, when they could be simplified and not made so difficult to find information needed. I am 83-years-old, and I am not computer savvy like the younger people are. Give us old people a break, please! I forgot to change my account number for VA disability until a day after it was due to be direct deposited. When will I receive this benefit now? The VA without my consent stopped my direct deposit of my compensation benefit with no reason for it, how can they do this? Now I am going to get a paper check. That’s really unusual. Did they have a problem with the deposit going through? That would be my first guess – if the deposit was getting kicked back. What did they say when you called them? Have you tried to re-enroll in direct deposit? Yes I am good for December but we have to try and find out how this happened so it doesn’t happen again to me or another Veteran. Changed my direct deposit on November 19,2018. Will I have to wait till the end of December to receive my payment? Or will they continue to deposit into the old account until the update has been made? Payments should continue to the old account until the update has been made. I don’t know if the VA has a cut-off date for making changes. Were you told an effective date when you made the change?